Living in Texas it can sometimes be a little difficult to look forward to the oncoming summer, what with its droughts and relentless heat waves. That anxiety is quickly diffused once I glimpse the new crop of garden fresh veggies at the grocery store. 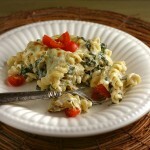 Here is a crisp, healthy pasta dish to embrace spring’s bounty and warmer months. This is a wonderful dish to prepare if you’ve blacked out in a farmer’s market and awoken in your kitchen to find yourself staring hazily at mountains of fresh produce. The first time I prepared this I was craving pasta primavera, but wasn’t wanting something heavy. I cut calories by removing half of the pasta and replacing it with loads of vegetables. Serving the dish slightly warm rather than piping hot really allows the texture and flavors of the vegetables to shine. A healthier pasta dish absolutely full of crisp, fresh veggies. Melt 2 tablespoons of the butter in high sided skillet. Add minced garlic and sliced mushrooms, sprinkle with a pinch of salt and cover until the mushrooms release their juices. Stir in chopped broccoli and carrots, cover and let steam for about 7-8 minutes until crisp tender. Transfer veggies to a bowl (reserve any liquid in the pan if there is some) and leave covered while you prepare the sauce. Meanwhile cook pasta in well salted water according to package directions. I used a refrigerated pasta by Maffei which is 180 calories per 1/2 cup. You want it perfectly al dente or just a hair shy of al dente - you want the pasta to stand up to the crisp veggies. While pasta is cooking - in the same pan you cooked veggies in melt the other tablespoon of butter. Whisk in 2 tablespoons of flour - it will be very thick. Let cook for a minute or two to cook off the raw flour taste and then add milk, black pepper, fresh thyme. Remove from heat and whisk well. Transfer pasta plus 1/2-3/4 cup (depending on how thick you want your sauce to be) of the pasta cooking water to the pan along with all of the veggies, the green peas, and your grated parmesan. Toss well and cover to let the peas warm through. This will also slightly cool down the pasta and veggies. This is ok as the slightly cooler pasta maintains the fresh flavor and texture of the tomatoes. When the peas are warm add fresh basil and chopped tomatoes, toss well and serve immediately. Ideally your pasta water should have been salted well enough that you wouldn't need additional salt, but feel free to add more if needed. 358 calories for 1/4 of the pan as I've prepared it. Cooking the mushrooms in a bit of dry white wine (maybe 2 ounces) adds lovely flavor to the dish. It’s been over a month since my last post, which means I have all kinds of things I can talk about this time around. A little while back Jah presented me with 3 seats to a local cheese-making class with The Dallas Mozzarella Co. Jah and I brought my friend Leanna and we had a great time making fresh ricotta, mozzarella, oaxaca, and a fresh olive stuffed mozzarella roll. Of course with all of that unbelievably fresh cheese in my fridge, how could I resist making something like this beautiful tomato asparagus panzanella salad? Before I delve too much into the details of salad making (not that this salad has many – it’s so simple), I thought I’d talk a little about springtime in Texas. The telltale sign of spring is when the bluebonnets carpet the landscape. Not wanting to miss one of the prime spots for this surreal display of color, I drove out to Ennis, TX with my friend Chris to be able to photograph the fields at sunrise. Needless to say it was a worthwhile adventure! After enjoying the brisk air (ok I was freezing ) we hopped back in the car and roamed the country side looking for more lovely photo ops. Along the way we stopped and snacked on the moist double chocolate zucchini muffins I packed for the trip (a recipe I’ll definitely have to share later). We saw deer, rabbits, horses, longhorn cattle, and even a grumpy minidonk! After a brief detour into a local winery we found a gorgeous field blanketed with bright red Indian paintbrush and had to get a shot. Texas has a bit of a reputation for being a large expanse of dessert… essentially the prototype for every old western ever made. Believe it or not there is green stuff here too! But enough about all of that. You’re here for juicy, ripe tomatoes, aren’t cha? Me too, man… me too. Panzanella is an Italian salad made with bits of bread, often as a means to use that day old loaf you’ve got sitting around. With such simple ingredients quality is really going to make a difference, so make sure to get the best tomatoes you can find. I love to mix varieties for a more colorful presentation, plus it adds a little complexity to the overall flavor. I make this style of salad fairly often whenever I’m preparing food for a large group of people, because it is so easy to multiply out to serve more. A simple Itaian salad tossed with cubes of toasted day old bread. Toss bread cubes with about a tablespoon of olive oil and sprinkle with a little bit of sea salt. Bake at 425 for about 8 minutes until nice and toasty. Keep an eye on them as oven temps may vary. I give them a shake in the pan about halfway through. Combine olive oil, tomatoes, asparagus, fresh basil, and mozzarella in a large bowl and toss well to coat. Season liberally with salt and pepper. A few minutes prior to serving combine the tomato mixture with the toasted bread crumbs. Calorie count for this dish will vary a bit since the measurements are thrown together rather loosely. I find it often falls between 320-370 per serving whenever I make it. I’ve wanted to make something like this for a while, and whenever I saw the pile of vibrant heirloom tomatoes at the grocery store I knew the time had come. The beautiful variegation is simple to do, but any color of tomato will taste amazing. Only good things happen when you combine fresh tomato, basil, and burrata cheese. The first time I made this we basically stood over the counter eating it slice by slice until it was gone, accidentally spoiling our dinner. I wasn’t super happy about the photos I took the first time around, so I made this recipe again the following night. We told ourselves that we couldn’t inhale the entire loaf like we did before. Our intentions were good, but so is this bread. The baguette won us over and we ate the whole loaf again. Fans of bruschetta will undoubtedly love it as much as we did. Or just fans of tomato. If you’re unfamiliar with burrata, it’s basically a pouch of soft stretched mozzarella stuffed with even softer mozzarella and fresh cream. Its flavor is subtle, milky, and awesome. If you can’t find burrata you could always use buffalo mozzarella or even something like ricotta if you prefer to have a spreadable consistency. A beautiful appetizer made with colorful heirloom tomatoes, burrata, and fresh basil. Brush the tops of each half of the french bread with 1 tablespoon of the olive oil. Place in oven for about 5 minutes until lightly toasted. If you prefer your bread more toasty just leave it in a little longer. 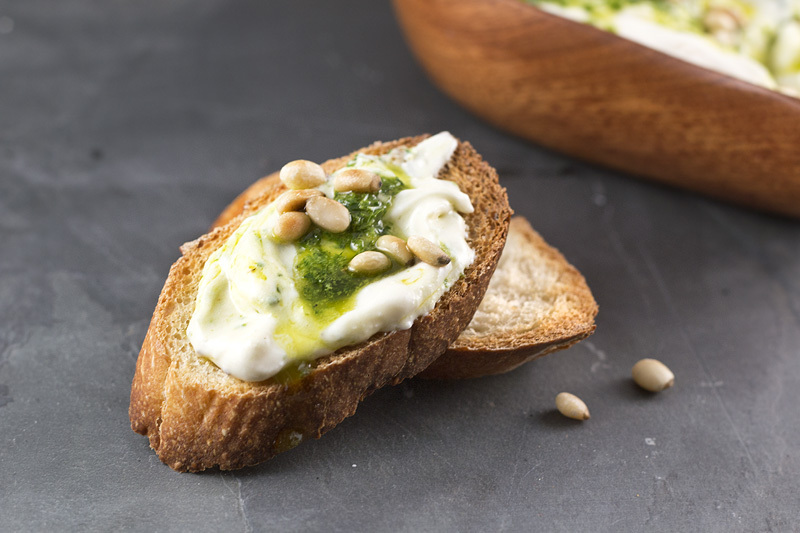 Spread burrata over each half of the toasted bread. I use my fingers to break up the outer pouch of stretched mozzarella into little pieces. Drizzle with remaining 1 tablespoon of olive oil, sprinkle lightly with a little salt and fresh black pepper. Scatter chopped basil over the top of the cheese and then arrange sliced tomatoes on top of that. I used four tomatoes (I got about 4 slices out of each, two for each half) in a purple eggplant color, deep red, orange, and yellow. You could also alternate two colors or just use one color across the whole thing. Season with a little extra salt and pepper, slice, and enjoy! Sometimes when you’re running low on ingredients, you’re forced to improvise. To make unusual decisions resulting in things you might not ordinarily try if you had say… some tomato sauce or mozzarella cheese around. The results of this culinary ad-libbing has a name… and that name is spicy avocado pizza. Don’t let the spicy part frighten you. While this pizza definitely packs some warmth, the avocado is surprisingly effective at mellowing the heat out once it hits your tongue. The first time I made this pizza I made it with a whole avocado, pepper jack cheese, and no jalapeños. After revisions the pepper jack cheese was upgraded to habanero jack cheese (oh yes), the avocado was cut in half, and sliced jalapeños were scattered across the top. Cranking up the pepper dial to 11 and halving the avocado resulted in just the balance I was looking for. So if you have a pizza crust lying around but only have ingredients on hand for guacamole – fear not! This pizza will save you. A perfect balance of peppery kick and cool, creamy avocado - on a pizza! Preheat oven according to package instructions for your prepared pizza crust. Blend avocado with the olive oil, lime juice, and a pinch of salt. Spread evenly over the crust. Sprinkle half of the cilantro atop the avocado, then top with shredded cheese. Scattered sliced jalapeño and quartered tomato over the pizza. Transfer to oven and bake according to package instructions. Remove pizza from oven and top with remaining fresh cilantro. Slice and serve. Calorie information is based on using the prepared pizza crusts by Pizza Romana. I’m going to blunt when I start off this post today – I love this soup. It contains caramelized roasted cauliflower, potato, sharp white cheddar, sour cream, and fresh parsley. If you know anyone that is on the fence about cauliflower, throw a bowl of this soup at them and knock them down. Onto the cauliflower loving side of course. You can break the steps of this recipe into two parts if you prefer. The cauliflower can definitely be roasted ahead of time so you only need to worry about the soup itself when dinner rolls around. I find that the entire process overlaps pretty well though, and that if I get the cauliflower in the oven first everything else is ready by the time it’s done cooking. I believe it would also be pretty simple to cut the calories in the recipe by using skim milk, a reduced fat cheese, and reduced fat sour cream. I personally find this soup is hearty enough to eat as a meal with a chunk of good bread, and at less than 350 calories per bowl I don’t feel too bad about going full fat for really good cheesy flavor. I don’t call myself the Gouda Monster for nothing! Preheat oven to 425F. 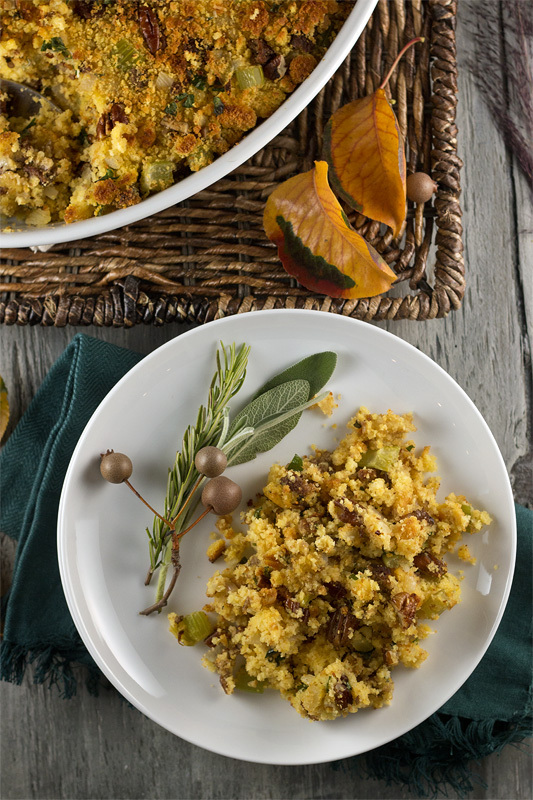 Toss cauliflower florets with the 1/2 tablespoon of olive oil and layer on a parchment lined baking sheet. Sprinkle with salt and place in the oven for 20-25 minutes, or until the cauliflower starts to brown on the edges. Heat the other teaspoon of olive oil in a nonstick pan and lightly cook your onion and garlic for a couple of minutes, before adding in the diced potato. Cook the potato for 2-3 minutes, pour in the stock, add the bay leaf, and bring to a gentle boil. Reduce heat to medium low, cover, and allow to cook until the potatoes are fork tender. This happens more quickly if your potatoes are finely diced. When the cauliflower is roasted, add it to the soup pot with the potatoes. I recommend reserving a few pieces for garnish because they are just so tasty on their own. Keep soup covered while you make your roux. In a small sauce pan melt your butter down. Once hot sprinkle the flour over the top and whisk until smooth. Cook for about a minute and then add your milk. Season with black pepper and nutmeg. Continue whisking the mixture until it thickens slightly - about 5-8 minutes. Remove soup from heat. Using an immersion blender puree your soup to desired consistency (I like to leave it a little bit chunky). If you don't have an immersion blender you could transfer the soup to a regular blender to puree in batches. Stir in the thickened milk sauce, sour cream, shredded cheese and fresh parsley. Season with additional salt and pepper if needed. This giveaway has ended – Thanks to everyone that participated! And now of course for the contest information! I’m really excited to finally be able to have my first giveaway on Gouda Monster. For Christmas I got two immersion blenders – what a lucky break for my readers, right? My hand blender is probably one of my most coveted kitchen gadgets. After mine broke I felt lost without it – there is definitely no easier way to quickly puree a soup or whip up small batches of sauces, dressing, or salsas. I also use mine to create smoothies in the morning because I find cleanup to be far simpler than a full sized blender. The particular model up for grabs is the Cuisinart CSB-75BC Smart Stick 2-Speed Immersion Hand Blender in Brushed Chrome , which holds a glowing 4.6 out of 5 stars on Amazon. There are several ways to enter and entries will be open for two weeks, however due to shipping costs I will only be able to ship to people that live within the United States & Canada. The winner will be announced by the end of the month – good luck! While I generally prefer cows’ milk cheese to those made with goats’ or sheep’s milk, feta has always been one of my favorite cheeses. Whole Foods even makes a really nice (and lower priced) cows’ milk feta that I love. One of the things that’s so great about feta is that its pungent flavor means you only need a small amount to perk up a wrap or salad. Of course feta is also crumbly… a little bit messy even. Did you ever want to take that salty, tangy deliciousness and turn it into something more manageable? Something you can spread on toast or eat in a tortilla without it falling out of the ends? Well then – I have just the thing for you! When I first tasted a dollop of this right out of the food processor, a grin immediately spread across my face and I exclaimed, “YUM! 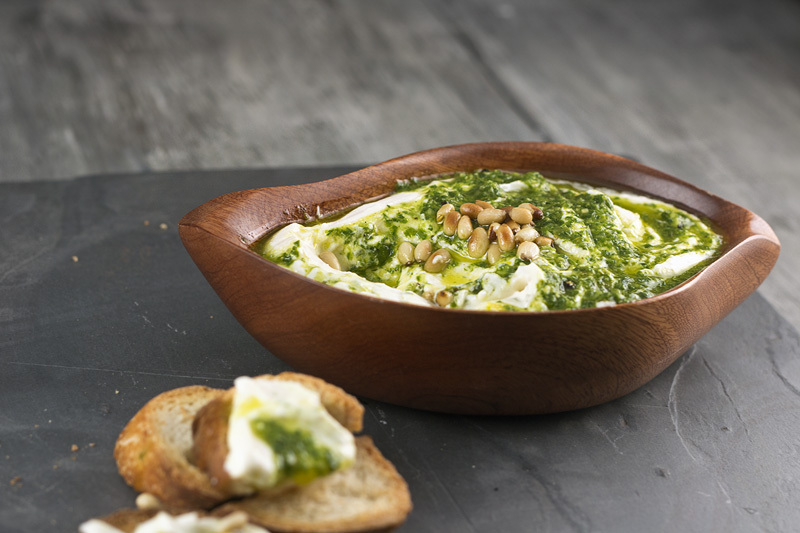 This is GOOD!” It’s got all of the flavor that you love from feta cheese, but in a smooth, creamy consistency that is perfect for dipping and spreading. 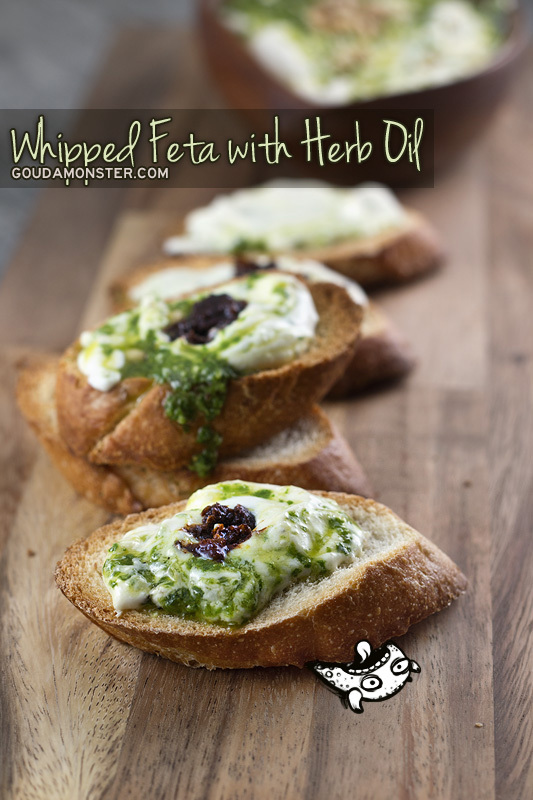 The drizzle of herb oil over the top adds a dimension of freshness that slightly counters the saltiness of the cheese. In my opinion it’s even better if you add something slightly sweet on top of it, like fresh diced tomatoes (my favorite), sun-dried tomatoes, a balsamic reduction, honey, or whatever else your creative mind can think of. I also absolutely loved the addition of toasted pine nuts for a little bit of texture. With this being the season for parties – and limited time to prepare for said parties – this appetizer is a quick and elegant option for guests. And hey, if you’re not the party going type (raises hand) then this is still awesome to spread on toast at breakfast, on a Mediterranean wrap at lunch, or to toss with a bit of cooked pasta and steamed veggies at dinner. As far as flavor is concerned, a little goes a long way. 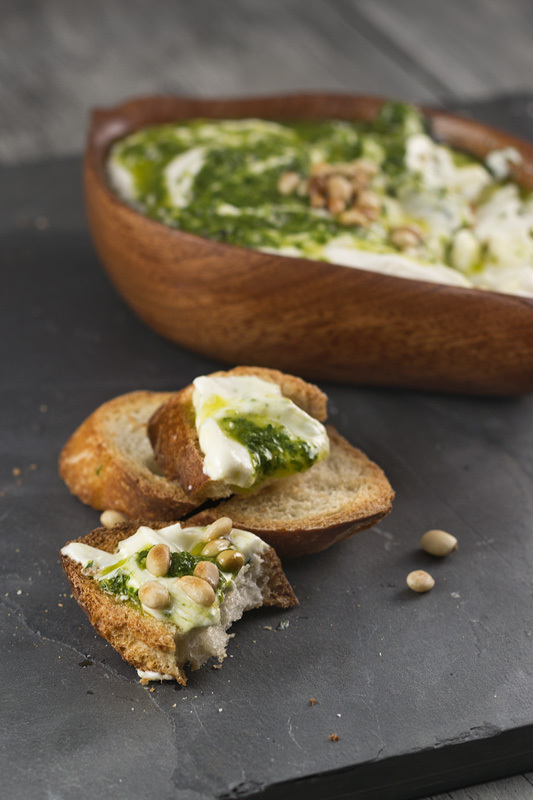 The wonderful flavor of feta and fresh herbs in a simple, elegant spread. In a food processor combine fresh herbs, garlic, lemon zest and juice, salt, pepper, and olive oil. Blend well and transfer to another container – I used a liquid measuring cup so it would be easier to pour out over the cheese later. If you want your cheese spread to remain white, wipe out the residual oil and herbs from the food processor basin. Add both cheeses to the food processor and blend until smooth. Once smooth add the heavy whipping cream and black pepper. Pulse until mixture is creamy and light. In a serving bowl alternate adding the cheese and a drizzle of herb oil, ending with the herb oil on top. If desired top with toasted nuts (the addition of nuts isn’t factored into the calorie count below). Serve with crackers, crostini, chips, fresh veggies, or whatever else you like. This robust spread pairs well with something sweet. Having fresh tomato slices, sun-dried tomato, balsamic, or honey available to drizzle over the top is awesome. Sometimes I find it hard to believe that I didn’t like dressing as a kid. I’m not sure why it took me so long to evolve into a rational human being with properly functioning taste buds, but fortunately I wasn’t crazy forever and now I’m an honest to goodness dressing fiend. Like most families, our Thanksgiving table is steeped in familiarity and tradition. The spread rarely changes – roasted turkey, mashed potatoes with gravy, cranberry sauce, macaroni and cheese, token green veggie casserole of some sort, dinner rolls, and of course good ol’ cornbread dressing. 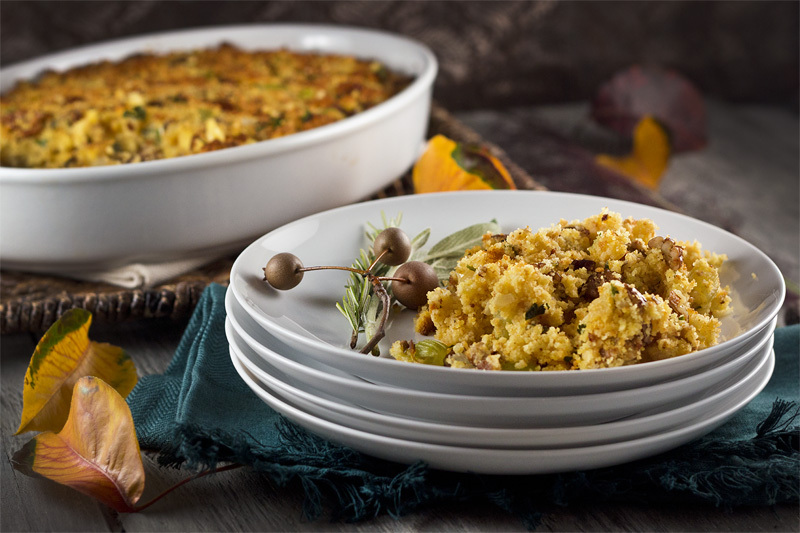 Dressing – or stuffing if that’s what you prefer to call it – seems to be a very personal thing and the idea of what makes it good varies from family to family. But if someone were to ask me about the dressing I crave (I’m going to pretend you just did), then I would tell them it would definitely be this adaptation of the recipe my dad makes every year. My changes from the original are probably a little bit obvious if you are aware of the fact I ate meat until I was 18 – so naturally the main adjustment was making it vegetarian friendly. Dad also prepares his with chopped up hard-boiled eggs, something that’s never been my cup of tea but a lot of people really enjoy eggs in their dressing. If you’re a vegan and looking to adapt this to your lifestyle, substitute the butter with olive oil or margarine and omit the parmesan cheese. Adding a couple of tablespoons of nutritional yeast would be awesome in its place. You’ll also want to make sure that the breakfast sausage you use is vegan friendly. On the other hand, if you’re a meat-eater you can use regular sausage – but make sure it is cooked before adding it to the recipe. 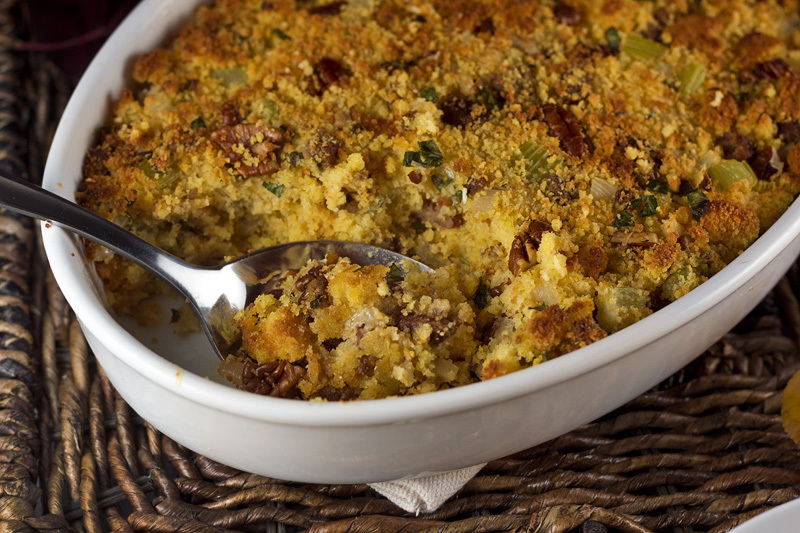 A vegetarian friendly cornbread dressing with fresh herbs, sausage, and pecans. Preheat oven to 375F. Butter your casserole dish (I used an 8″x11″ oval dish) and set aside. In a nonstick skillet heat butter, sage, and rosemary on medium heat until the butter just starts to bubble. Add onion, celery, garlic, salt, and pepper then cook for another 3-4 minutes. Remove rosemary sprig and transfer the contents of the skillet to a large mixing bowl. Wipe the skillet clean and toss in your chopped pecans. Toast over medium heat until fragrant and then add them to the mixing bowl. Crumble the cornbread into the bowl with the sausage, parsley, and cheese. Toss everything until well combined. Taste and add a little more salt if needed (I find the individual ingredients usually have enough sodium on their own that it doesn’t need it). 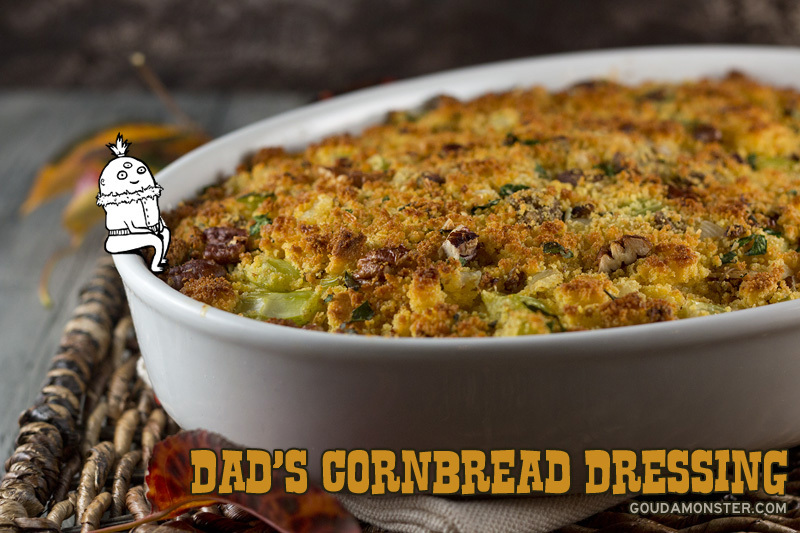 Transfer the cornbread mixture to your prepared baking dish and lightly pack it down. Pour stock evenly over the top. Place dish in the oven and bake for 40 minutes. If you prefer the top to be a little more crisp, pop it under the broiler for a minute or two. You can easily get this recipe under 200 calories by using half of the pecans and cutting the butter back to 1 tablespoon. Add a touch more stock to compensate for the reduced amount of butter. It’s been a little over a week since I made a new post, because I had some fun things going on. We went to Blizzcon again this year, making it our 5th trip to Anaheim for the big event. What set this year apart from the others was the fact that a total of 10 people from my WoW raiding group were able to go. The day before we left for the airport I started preparations for goodie bags to give to everyone. 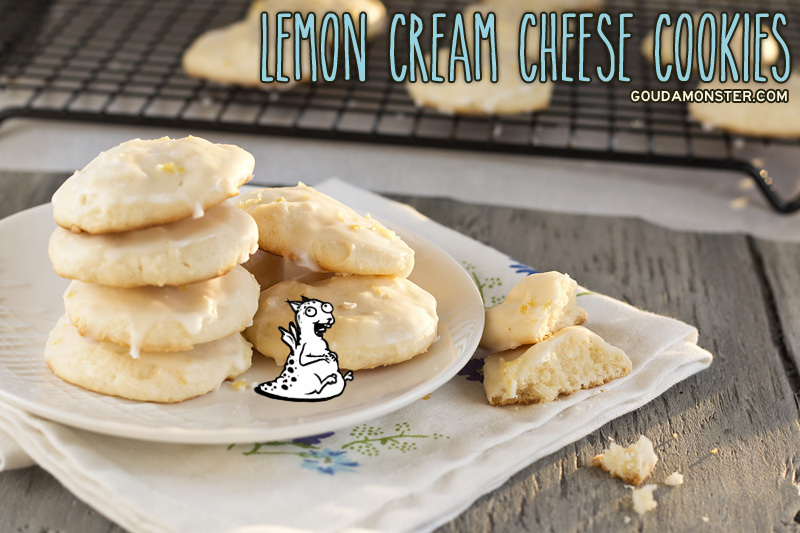 In each bag I included jalapeno cheddar crackers, garlic rosemary crackers, chocolate chip cookies, and the recipe I am sharing here today – lemon cream cheese cookies. Everyone that tried them and reported back to me really enjoyed them. I enjoyed how easy they were to make! I love it whenever I experiment with baking and get awesome results like these. I had originally intended to create a pecan pie fudge to pack in the treat bags, but I realized I didn’t want to fiddle around with candy making so close to a trip. There were a couple of small lemons on my counter and I decided to do something with them instead. On a whim I asked Jah to stop on the way home to buy me a tub of cream cheese, even though I had no idea how adding cream cheese to a cookie dough would affect it. The resulting texture is a tender and cake-like with a delicate lemony sweetness. 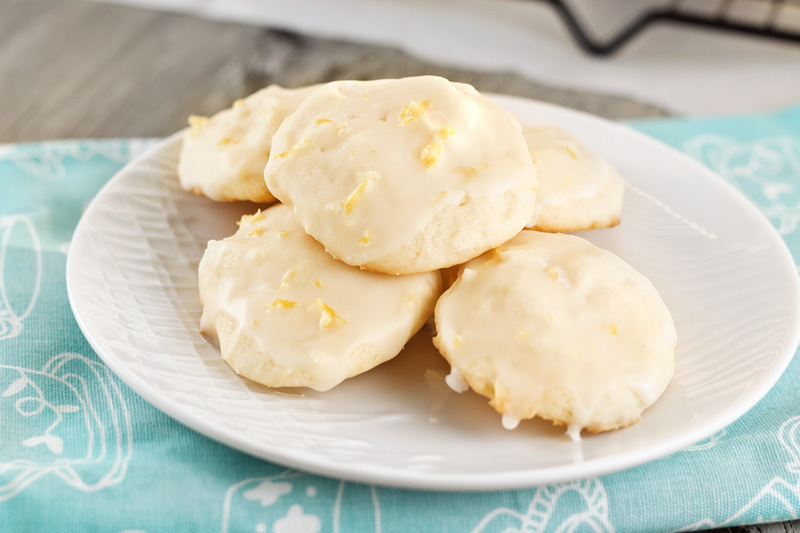 The lemon flavor is enhanced with an easy-to-prepare lemon zest glaze that each cookie gets dipped into. 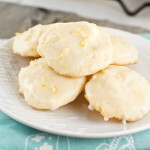 Soft, cake-like lemon cookies with a lemon zest glaze. Beat softened butter and white sugar until light and fluffy. I did everything in my food processor, which made it quick and easy. Add lemon zest, lemon juice, egg replacement, vanilla, and baking powder. Pulse until combined. Add cream cheese and mix until smooth. Gradually add in flour, 1/2 cup at a time, combining well after each addition. 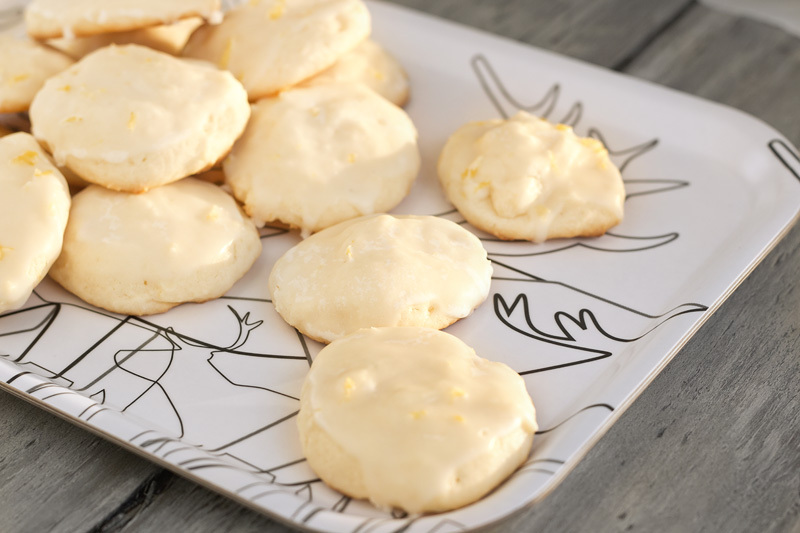 Using a melon baller, cookie scoop, or heaping tablespoon, place balls of dough on a parchment lined cookie sheet about 1 1/2 inches apart. I fit about a dozen per sheet. Bake for about 16 minutes or until the edges are just barely golden. Allow cookies to rest on the sheet for about 5 minutes before transferring to a cooling rack to cool completely before icing. 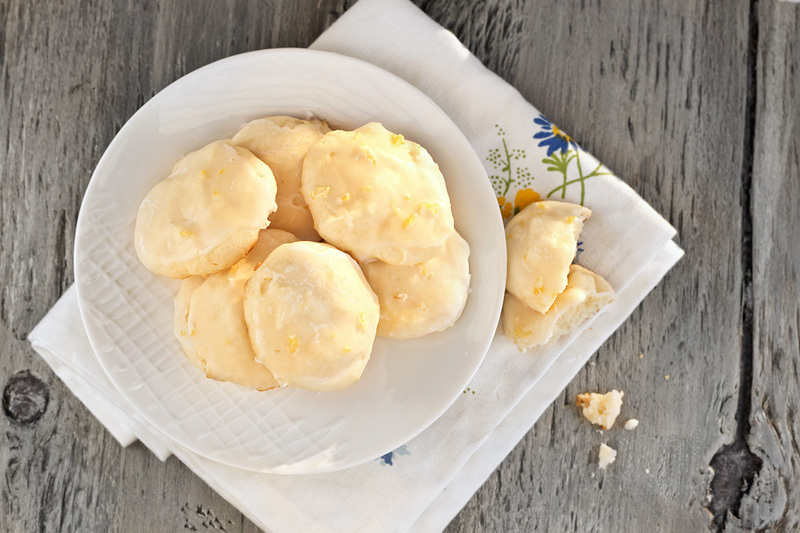 In a small bowl whisk together powdered sugar, lemon zest, lemon juice, vanilla, and whipping cream until smooth. If you prefer the glaze a little thinner you can add more whipping cream, or more lemon juice if you prefer a tarter glaze. Dip the top of each cookie into the glaze, shake off the excess, and place back onto the cooling rack. I recommend laying a sheet of wax paper under the rack to catch any glaze that drips through. It makes cleanup much easier. Allow the glaze to harden (about 30 minutes) before packing the cookies away. I’ve realized that I rather love the challenge of making foods to fit a certain theme, such as my breaking bad cupcakes and Halloween eyeball cookies. I decided that I wanted to do it again, but with something savory. 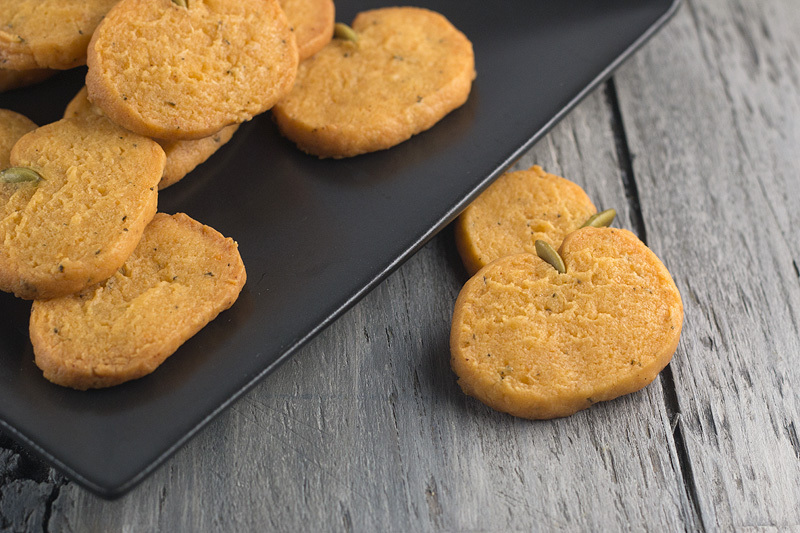 On Saturday night I was attending a Halloween party and it felt like the perfect opportunity to try out the idea I had – adorable pumpkin shaped cheddar cheese crackers with fresh rosemary. I ended up being really happy with the results! It was hard to stop eating these things once they came out of the oven. I was “lucky” enough to have a few misshapen pumpkins, which gave me a perfect excuse to pop them in my mouth. I made an additional batch with a blend of white cheeses, garlic, and fresh dill that were amazing as well. I will definitely be remaking those for a future post. 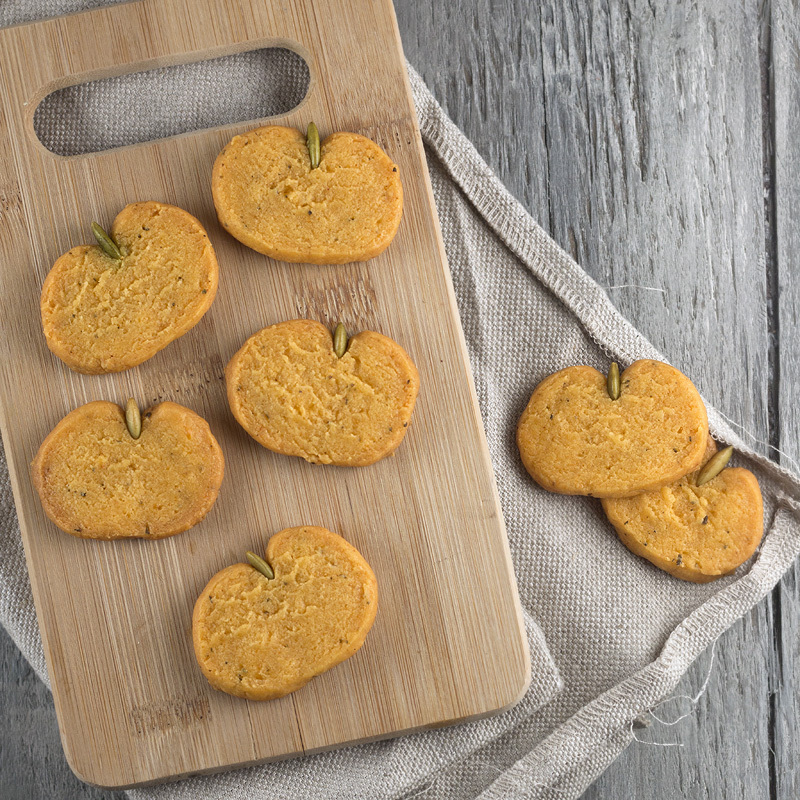 For now I’m sticking with sharing these cuties, because they are perfect for a fall table, a Halloween party, or a bit of Thanksgiving pre-feast snacking. Unfortunately we ended up being very late to the party, due to a few costume complications. 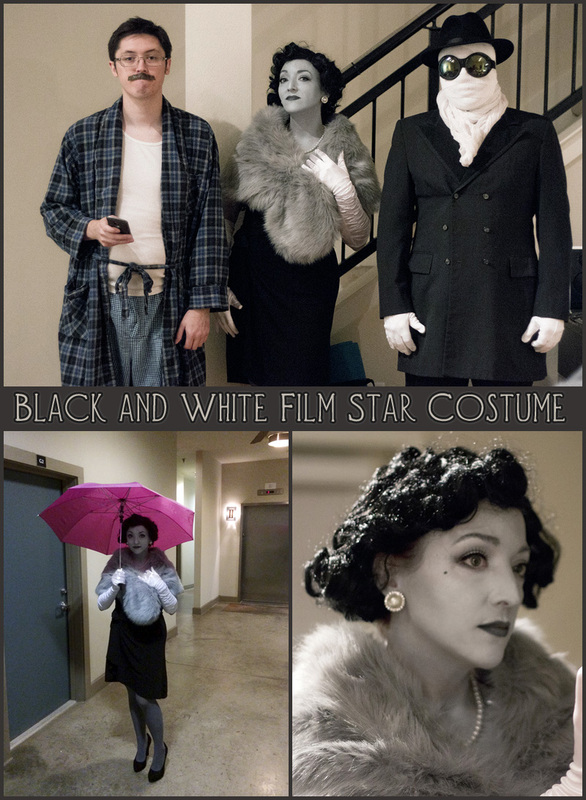 I decided to attempt to transform myself into a sassy dame of the silver screen. The makeup test run I did a few days before the party didn’t prepare me for some of the problems I’d run into with makeup transferring to my clothes. I learned (after a lengthy trial and error process) that next time I need to set the makeup with significantly more translucent powder. On the bright side you can learn from my mistakes if you want to attempt this really unique costume! All you need to do is blend black and white makeup to create a custom shade of grey for your skin tone (I used Makeup Forever’s clown white and black color flash stick) and apply it to all places where your skin will show. Set with powder and a bit of makeup setting spray (I’ve heard hair spray works but I have no idea whether that’s a good idea haha) before applying makeup as usual. I used matte white, grey, and black eye shadows for shading and highlighting, grey eyeliner on my lips, black on my eyes, and white on my waterline. The result is definitely something people will talk about and it looks fantastic in pictures! But you didn’t come here for costume ideas. You want crackers in your belly. You’re in luck because these crackers are really easy to make too. I’ve made cheese crackers many times before and usually it involves rolling out the dough and cutting the crackers into squares. I find that process somewhat tedious and time consuming, so changing it up to a log ‘n’ slice method makes it much easier. With a little manipulation you can slice your crackers into little pumpkin shapes that people will think you put a lot of effort into. Simply roll out a log as normal, flatten it slightly, and create a groove in the top – similarly to the top half of a heart. I used the flat handle of a spatula to do it. I pressed it down into the dough, shimmied it back and forth a little to create a V shape, and use my fingers to soften the harden edges. A couple of minutes later you should have something that looks like this. Wrap the log up and transfer to the freezer for 20 minutes to firm up. This will allow you to slice your crackers much more easily without deforming the shape. With a very sharp knife, slice your crackers into approximately 1/4″ pieces. If you want a more crisp cracker you can go as thin as 1/8″. 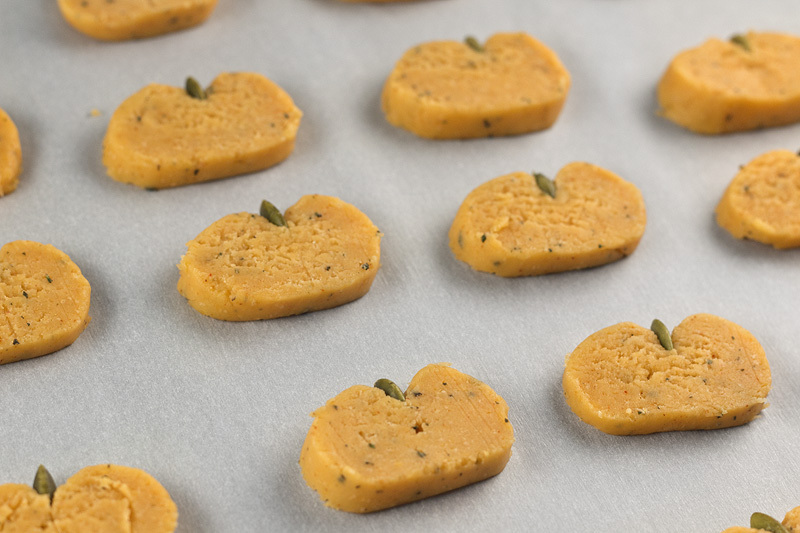 Gently wedge a pumpkin seed into the top groove of each pumpkin and transfer to a parchment paper lined sheet for baking. I was able to get about two dozen crackers from the entire batch, but if you choose to do a thinner cracker you should get almost double that. The resulting texture of the thicker cracker is almost like a crumbly, crunchy shortbread. The sharpness of the cheese along with the woodsiness of the rosemary packs so much rich flavor that you won’t want to stop eating them. 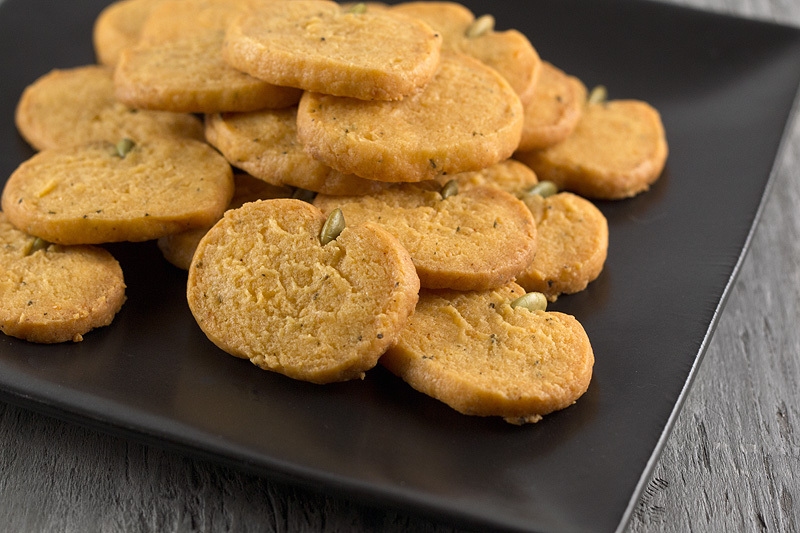 Pumpkin shaped cheese crackers with rosemary are as cute as they are simple. If you have a grater attachment for your food processor, grate the butter and cheese together. I know this sounds a little strange, but I find this to be a huge time saver. Otherwise you can cut the butter into small pieces and blend it with grated cheese. Transfer the mixture to a small bowl and set aside. Add flour, rosemary, and seasonings to food processor and blend until the rosemary is in small pieces. Add cheese mixture to the flour and pulse until crumbly. With the food processor running, add water 1 teaspoon at a time until the dough comes together in a ball. You may only need a tablespoon, so only add as much as is necessary. 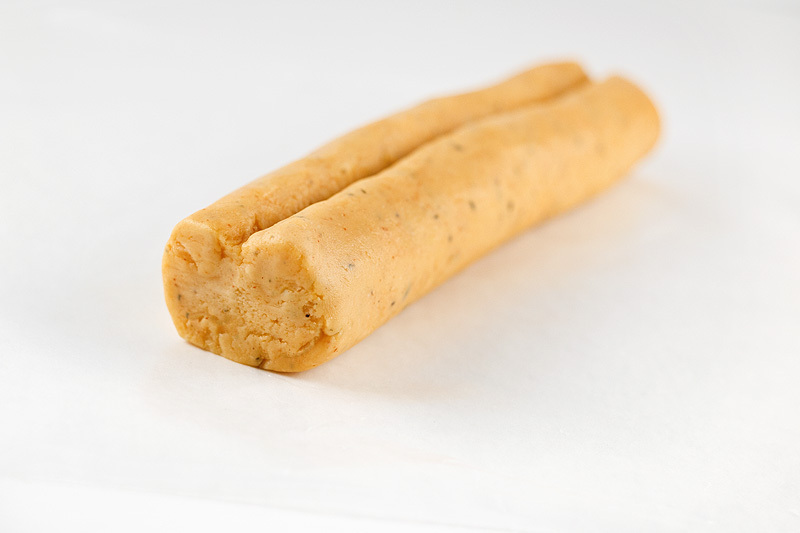 Divide dough into two pieces and roll each one into a log shape. I did this on a sheet of parchment paper so it wouldn’t stick. If your dough is too crumbly you may need to knead it for a moment or add a touch more water. Flatten each log slightly so they are a little bit squat. With a thin, flat object (a handle, a clean ruler, the blunt edge of a knife) press it into the top of the dough and shimmy it back and forth to create a V shape like the top of a heart. Use your fingers to soften any hard edges. Wrap the logs up and transfer to the freezer to chill for 20 minutes. Remove dough from freezer. With a sharp knife slice each log into 1/4″ pieces. For a more crisp cracker you can go as thin as 1/8″. 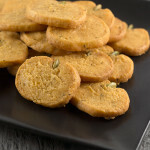 Gently wedge a pumpkin seed into the top groove of each cracker, place on a parchment lined sheet, and bake for 12-15 minutes or until slightly browned at the edges. Thinner crackers may need less time, so keep an eye on them. Remove from oven and transfer to cooling rack to cool completely before serving (though they are delicious warm from the oven)! The classic pairing of grilled cheese and tomato soup is one of my all time favorites. It’s something that I – and most other people I know – grew up eating, so as adults it has evolved into no-fuss comfort food. Nostalgia aside, it’s incredibly easy to make a more grown-up version of this dish that will make you want to throw away your can opener and forget the name Campbell’s (except don’t toss the can opener because you need it for the tomatoes). I grow basil on my balcony because I love it so much and it’s almost always the flavor used in tomato soup, but if you’ve never made your tomato soup with rosemary you’re in for a real treat. It’s particularly wonderful when fall starts to roll around because rosemary has a savory, evergreen-like aroma that reminds me of the upcoming holidays. The soup itself is very low calorie (less than 80 per bowl) but I still wanted to find a way to trim down the calories on the grilled cheese front. In the end I decided to make open-faced grilled cheese “fries” so that each person only got one slice of bread instead of two. Not only is it a little bit healthier, but they are the perfect finger food for dunking into a piping hot bowl of soup. But yeah… I still ate two slices of bread because the fries were too delicious. Oh well… I tried! While making this for lunch today I didn’t remember until the very end that my immersion blender was broken. I ended up transferring the soup to the food processor to puree it which made me realize how much I LOVE my immersion blender. If you don’t have one of these and you find yourself making a lot of stove-top soups and sauces I highly recommend getting one. It makes your life so much easier! Doing it in the food processor or in the blender works fine though, just make sure that you’re careful as the hot liquid can splash around and make a mess – especially if you overfill the basin. For the grilled cheese sticks I think using a combination of cheeses is the best way to go, but use whatever you have around. For mine I used a mix of sharp white cheddar, a colby-swiss blend, and mozzarella. The sharp cheddar gives it a nice pungent flavor while the other cheeses give an ooey gooey melty consistency. I used a total of 5 ounces so it would be a little under a serving of cheese per person – another area where I was trying to skim off a few calories. The bread I used was a white Italian bread with a subtle open crumb. The shallow holes end up creating yummy cheesy pockets of awesomeness, and in some cases the cheese oozed through and browned a little on the bottom when grilling – perfect. Warm, comforting tomato soup infused with the scent of fresh rosemary. Heat olive oil in soup pan on medium high heat. When hot add onions, carrots, garlic, rosemary, and the 1/8 teaspoon of salt. Let cook for several minutes until the onions are just slightly caramelized. Pour stock into the pan, making sure to stir well to get all of the caramelized bits off of the bottom. Add entire can of tomatoes, bay leaf, and additional seasonings. Bring to a boil, reduce heat to low, cover, and let simmer for about 20 minutes. Remove bay leaf and rosemary sprig from the soup. It’s ok if any rosemary leaves fell off while cooking, as they will be blended in when you puree the soup. Turn off the heat. Using either an immersion blender or food processor, puree soup to desired consistency. Transfer back to pot stir in the heavy cream. Serve immediately. Fun twist on traditional grilled cheese – perfect for soup dunking! Preheat a skillet on medium high heat and turn on your oven’s broiler. Brush each slice of bread with the melted butter on one side. I had a little extra butter leftover and just poured it into my soup pot – yum! Place your bread, butter-side down, onto your hot skillet. Put shredded cheese on top and allow it to get nice and seared on the bottom. Transfer the bread slices to your oven to brown the cheese. It happens pretty quickly so take care not to let it burn. Put cheese bread on cutting board and let cool a couple of minutes before slicing into sticks. Top with fresh black pepper. For those times when you can’t decide between taco night or pizza night, may I present for your consideration – Taco Pizza Night! I love this recipe because it’s high in protein and easy to throw together. Not only that, but you can scale the calories back to 170 calories per slice (340 calories for 1/3 of a 10-inch pizza) by using a reduced fat cheese and leaving off the avocado. Personally I think the 205 calories per slice is totally manageable in my diet though… and I never like to forgo the real deal when it comes to cheese! If you’re looking for a simple weeknight meal that can be whipped up in under half an hour, then this pizza should make its way into your oven and then into your mouth. One of the things that makes this meal so easy to prepare is the use of a pre-made pizza crust. For the longest time I used whole grain lavash sheets to make a lower calorie variation on traditional pizza – like with my Quick Low Calorie Flatbread. Then I made an awesome discovery. One evening while doing my grocery shopping I came across the par-baked crusts from Pizza Romana and was shocked to see that the entire crust was only 300 calories. For comparison, a Boboli 8″ personal pizza crust is 380 calories while the 12″ pizza crust is over 1000 calories. The Pizza Romana crusts are about 10″ wide and made with very basic ingredients (flour, yeast, salt, oil). It makes for a perfect blank canvas to host an array of pizza toppings, and of course it worked wonderfully in this taco pizza. I’m able to find these at Central Market in Dallas – other HEB stores may carry them as well. If you cannot find these crusts in your area, Amazon happens to sell them by the 6-pack but the shipping cost is kind of ridonkulous. Another option would be making use of lavash as I did in my previous pizza recipe, or any other thin flatbreads that are readily available to you. And of course if you don’t care about the calories… by all means use whatever crust you want! Just make note that this could affect the overall cooking time. A simple-to-prepare weeknight pizza that’s full of flavor. Using half a teaspoon of your olive oil, rub it along the outer edge of your prepared pizza crust. Lightly sprinkle with salt if desired. I find this gives a nicer texture and flavor to the crust when it comes out of the oven. Heat the remaining half teaspoon of olive oil on medium high heat in a nonstick skillet. Put onions, peppers, and garlic in the oil and let cook for a few minutes until soft and fragrant. Add burger crumbles, tomato paste, water, and seasonings to the pan. Let simmer for about 5 minutes. Sprinkle about half of the cheese onto your pizza crust. Since there is no sauce the cheese will act as a “glue” to hold your toppings in place. Evenly distribute the taco crumbles over the top of the cheese and then top with the remaining shredded cheddar. Place pizza directly on the oven rack and bake for 6-8 minutes or until the edges of the crust are crisp and golden. Use your crust’s package instructions as a guideline for cooking time. Remove from oven and top with fresh tomato, avocado, and herbs. Calories listed are for 2 slices or 1/3 of the whole pizza. Non vegetarians can brown 1/2 a pound of ground beef in place of the crumbles. Make sure to drain off excess grease before seasoning. I calculated the calorie info subbing in 80% lean ground beef and the calories/protein content were almost exactly the same as the original. There is something gratifying about taking one dish that I enjoy and transforming it into another. It’s a realm between novelty and nostalgia that I want to find my way into, all while trying to maintain a health conscious lifestyle. 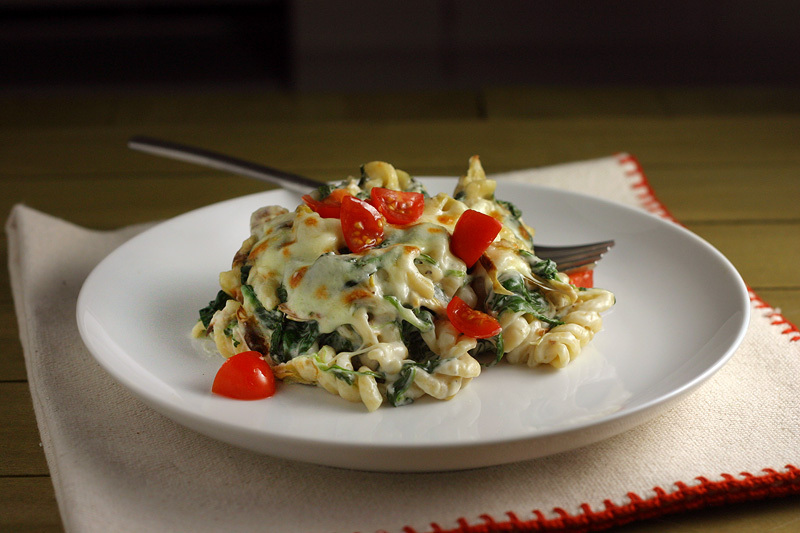 When I saw spinach and artichokes sitting in my refrigerator one night as I was trying to decide what to whip up for dinner, I knew that spinach artichoke dip pasta had to happen. The first time I prepared this pasta I tried to use of Greek yogurt to make the cream sauce more healthy. Although tasty in its own way I felt that the flavor wasn’t true enough to the original, so I set to recreating it with the more traditional – although reduced fat – cream cheese. I also figured why not roast the artichokes and garlic first? Hell yeah. This recipe makes for a simple weeknight meal and is a great way to get some greens into someone that would normally shun the stuff. It has the added bonus of fooling you into thinking that you’re eating something much naughtier than it actually is. You could go to Applebees to split a skillet of spinach artichoke dip and a mountain of tortilla chips with three people for about 500 calories a piece… and that’s before you even order dinner. 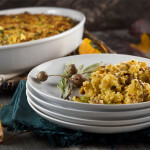 Or you could stay home and make a simple, filling dish that satisfies the desire for an appetizer and an entree in one go – for under 375 calories a serving. I know what I’ll pick, because let’s not kid anyone – I’d probably gobble up that whole appetizer by myself anyway. 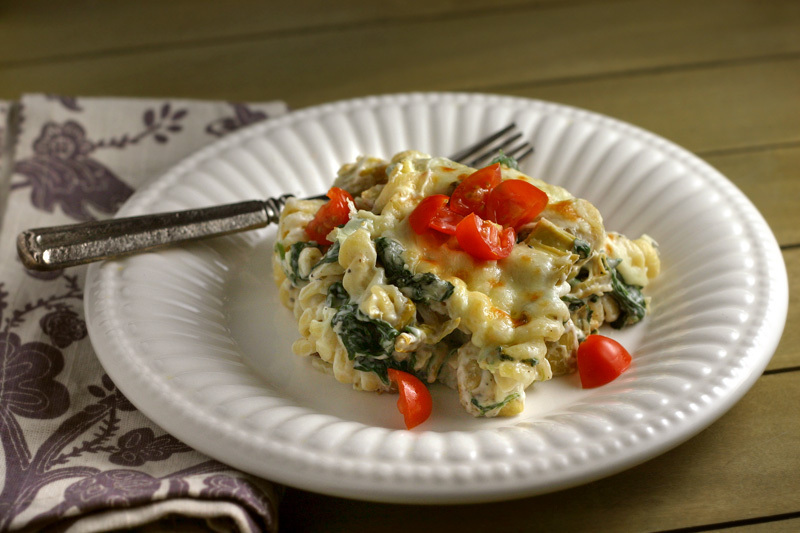 A party favorite transformed into a simple pasta dish with less than 375 calories per serving. Preheat oven to 400F and set a pot of water to boiling for your pasta. Spread chopped artichokes hearts and minced garlic onto a cookie sheet and spray lightly with cooking spray. Use your fingers to toss with 1/4 teaspoon of salt and place in the oven to roast for 20 minutes. While the artichokes are roasting you will boil your pasta according to package instructions and make your cream sauce. In a nonstick skillet melt the butter. Whisk in flour and let cook for a couple of minutes, it will be pasty but it will thin out when you add the milk. Add milk and bring to a light simmer, whisking until smooth and slightly thickened – about 5-7 minutes. Remove from heat and stir in the cream cheese and parmesan until melted. Add the Veganaise and season with salt, pepper, and oregano. By now the artichokes and garlic should be roasted. 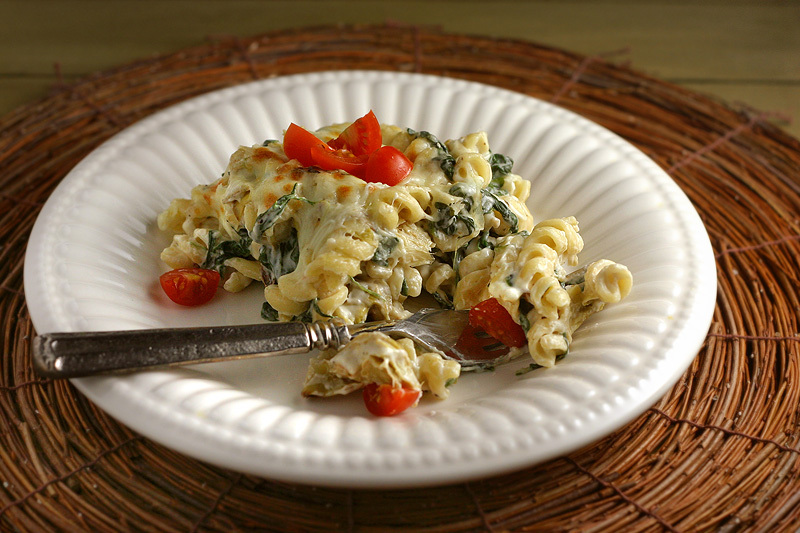 Combine them with the sauce, chopped spinach, and cooked rotini pasta, Transfer to a baking dish that has been coated with a light mist of cooking spray, top with shredded mozzarella, and bake for 15-20 minutes. Alternatively you could just pop it under the broiler for a few minutes to save time.